Owning an SUV or a jeep can be cool and if you do have one, it’s highly likely that you might be an enthusiastic person willing to take it off roads often. Trying to take it upon hills and in dangerous places can be fun but only if your SUV or jeep is equipped with all the necessary things one needs to have on a dangerous journey. One of the important things to have in your SUV or jeep is an electrically powered winch if you happen to take your vehicle out frequently and tread on places a normal sedan owner can’t get to. So why do you need an electric winch fitted in your vehicle? For one, you can help out fellow travellers on the road. Maybe their car is stuck in the sand or maybe out of fuel. You just get the hook off of your vehicle’s winch, hook it on the beam of the other car in trouble and just pull it out with our vehicle. It’s somewhat like towing with a cable. But the other main use of it is to get you and your own vehicle out of a difficult situation. Let’s say, you are brave enough to drive on the Rocky Mountains either just for fun or maybe your house is up there, electric powered winches can come into use in such cases. Maybe you accidentally went over a slippery and muddy area and all you have is a tree in front of you, an electric winch fitted onto your front or in some cases, rear bumper can be lifesaving. But there are many different types of electric powered winches to choose from. So many brands and each has its own features. One of the most important aspects of a winch is its weight pulling capacity. You don’t want your vehicle’s front bumper coming off with the pulling force, taking your precious winch with it! So how do you choose the best electric winch for your car? Well, let’s find out. Below is a list containing the best electric whiches and each with its Product Pros: and Product cons: and pulling capacity so it’ll get easier to choose one for your particular SUV or jeep or maybe even a truck if you own one. If you want to learn a bit more before purchasing an electric winch for your truck, check our buyer’s guide at the bottom of the article. Scroll down or click here. Smittybilt, is heavy as the brand name sounds, is here with its winch. What makes this distinction is not only the brand itself but the fact that Smittybilt uses a synthetic pull rope on the 98510 model. It does also feature a 3 stage planetary gear system with a strong drum braking system. One of its special features is that it’s highly water resistant. It is rated IP68 which means it will work well for being flooded in rough situations but to an extent. Another thing different about this winch is that it uses synthetic rope instead of steel ones, omitting the problem of rust build up. To conclude, you don’t need to worry about the build quality of SmittyBilt’s devices as they are just as popular as WARN and known to be heavy duty equipment for large trucks, heck, it’s the company that makes trailers and other heavy-duty equipment for 4×4 and other off-road vehicles! 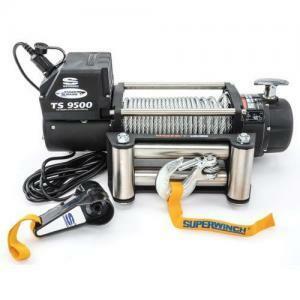 The warranties of this product is really great, lifetime mechanically warranty and 5 years electrical warranty, which tell us that the quality of this winch is not a problem! 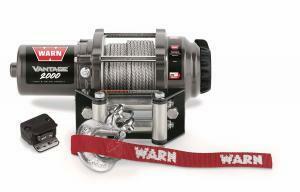 WARN is back with another high-quality winch. The reason for this is that WARN is a highly popular name in the market and well-known by the fact that it makes high-quality heavy duty and budgeted winches for different applications. This time, it’s the WARN’s M8000 model capable of pulling a load of 8000 pounds. Yes, it’s a lighter version of its other heavy duty winch models but still doesn’t compromise on the quality of the motor and materials used to make the housing of the winch. This electric winch is driven by a 4.8 horsepower motor with a 100-feet long wire rope. The motor is controlled by a remove with a 3.7-meter long cable. This winch can be used in about any truck or SUV like its other winches, only one needs to make sure to not exceed the max load-bearing capacity so that no damage to the winch and the car itself, occurs. Features a 3 stage machine to back the braking mechanism. WARN has another winch model in the store for you. This is the VR-12000 which means, this model can also have a weight pulling capacity of 12,000 pounds. 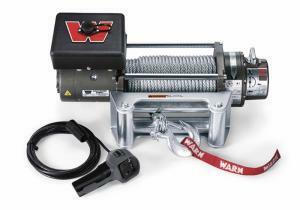 This makes this winch another heavy-duty electric powered device by WARN. But this winch is priced lower than its sibling mentioned above. Nonetheless, the power of the motor is not compromised. The pulling speed also matters in pulling and this model of WARN’s winches does a good job at it. The winch itself is made up of heavy-duty materials and equipped with a powerful motor capable of pulling at speeds which is faster than most other winches in the market today. Along with the speed, the braking is just as powerful. It’s made with the intention to be used in vans smaller than the usual size and many SUVs. With this winch, you will get a really strong motor, up to 12000 lbs which is dragged by a 28.6 meter wire rope which is controlled by a remove with 3.7-meter remote lead. Made from heavy-duty and high-quality materials giving it a tough and rigid layout. The ZEON has one heavy duty electric winch waiting for you and your vehicle. 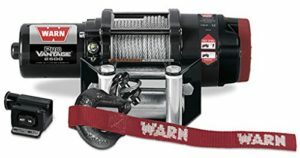 As many people and users of this winch say, WARN’s Zeon platinum 10 may be the most powerful and heavy-duty electric winch out there in the market at this time. It is called to be a heavy duty winch for a reason. The winch got a weight pulling capacity of 12,000 pounds which is just perfect for almost any situation. But wait, that’s not all! The era of advanced technology is here. No longer only have your laptop and cell phone had built-in Wi-Fi. This winch actually has a built-in Wi-Fi which provides you with the control over its operation. That way, you can easily control the winch without having to get out of your car. Not just that, but you’ll be able to check even the motor’s temperate. Overall, this is a great winch with a solid and powerful motor. This winch actually has a charging port which can be used to charge your cell-phone as you are on your journey. It acts as a car charger. Operating the winch becomes as easy as using your cell-phone. You will have all the functionalities to control the motor with your cell-phone. This winch is really heavy and isn’t called heavy duty just like that. This might add up to the weight of your vehicle. Another dependable name in the market, The MileMaker offers its SEC95 winch model which is said to perform extremely well under load and in difficult terrains. It has a powerful motor capable of pulling a max of 9500 pounds. Also, it’s built to be tough and can withstand water splashes without shorting out the electricals inside the winch. It is also claimed that it performs well in the snowy seasons. It’s made up of stainless steel which isn’t shiny from the outside, but strong from the inside which matters. 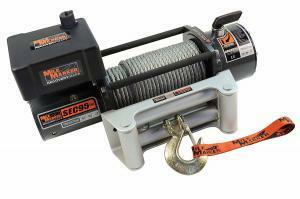 MileMarker also uses a synthetic rope with this winch. It is disappointing that a good power winch that has the potential to be called a great winch under a tight budget comes packed poorly. This one is a low priced and a budgeted power winch for those who can’t afford the heavy duty ones or don’t have that big vehicle, or simply need a power winch for minimal use. 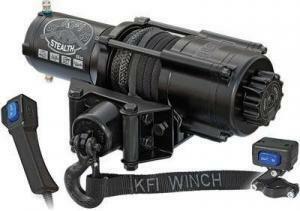 KFI has a budget-friendly winch with the model number SE45, capable of pulling 4500 pounds of weight. Its motor has a planetary 3 staged gear system and this winch has synthetic rope instead of a steel one. It can be controlled by a remote control with a long enough cord for easy operation. The winch can be powered using your car’s 12-volt battery. Although the brand isn’t as known as the others, it still manages to offer a good deal, for its price stated. That is to say that this winch may simply be for mild terrains and situations which doesn’t require extreme loads on the winch. Doesn’t include a universal mounting plate. 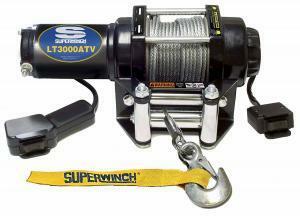 Another budget-friendly power winch, the SuperWinch retains high quality and a strong motor in its Tiger shark winch. It’s capable of pulling a max load of 9500 pounds and can be useful for people who don’t have an extensive use of winches. That doesn’t mean the winch is weak though. It is made up of a high quality steel with chrome buffing and a water resistant solenoid protected from water splashes. 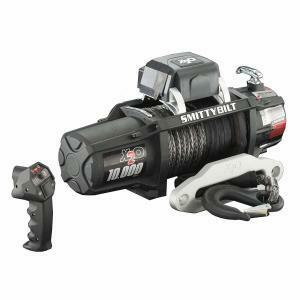 Overall it’s a durable power winch and its motor contains a 3 stage gearing system. The gears are made of up good material which makes the motor stand strong. It features an ergonomic design which makes the handling of the winch easy during installation. The only thing that pulls it down is its fuse which blows up under heavy load. That does imply that this particular model of SuperWinch is not intended for heavy use and this is a basic feature to prevent the motor from burning up. 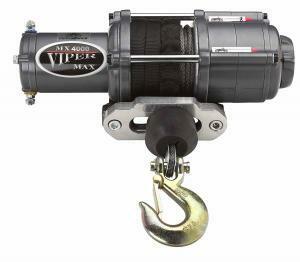 If you happen to drive in rough terrain but you need winch not too expensive, then the Viper’s ATV winch is for you. It is durable enough to be used in difficult situations and can pull a load of 4000 pounds. The company claims that their winch can be used to plough snow. The motor has a 3 stage planetary gear system and consists of a strong braking system which can hold the rope tight enough in about any situation. The solenoid is properly sealed so that water splashes don’t damage the internal electrical components. It is controlled by a small controller with a long enough cable to be operated while sitting in your car. Overall, provided the features for the price, Viper’s Max ATV winch makes for a good power winch for smaller vehicles. It is advised to check the mounting plate included with the winch before buying and installation if possible. 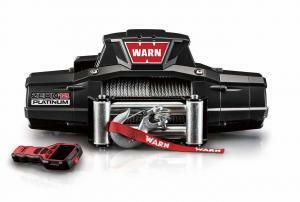 WARN has a lot of winch models with many choices for different people with different requirements. This one is similar to its other variants and built from strong quality steel for making of the winch housing and the motor itself. WARN’s Vantage 2000 can grab a load of 2000 pounds and features a lightweight yet a strong synthetic rope which will keep rust and corrosion at bay. The solenoid of the motor is properly sealed so that a little water doesn’t disrupt the working of the motor. It also contains a 3 stage gearbox and performs in various weather conditions perfectly despite its size. The gear housing is made of composite and allmetal gears. However a lot of prevent customers are claiming that the motor can freeze up if using it in really cold weathers. 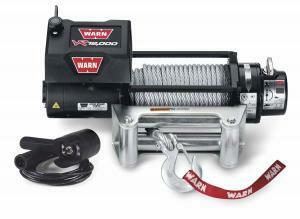 This time, WARN has an, even more, budget-friendly power winch for you. This winch is intended to be used on small 4 wheelers and all-terrain vehicles. Nonetheless, WARN products, no matter how budget-friendly, keep the quality as good as possible. It features a disc braking system and is fairly powerful. It can be controlled using a small remote with rockers. This winch is aimed for light use and relatively easier terrains. WARN winches, no matter what size, manage to retain their high quality and performance almost every car fanatic is familiar of even if they don’t own the equipment. The winch is made of materials which don’t let rust and corrosion build up. Features a 3 stage planetary gear system. Cable isn’t as durable and sturdy as on other winches. 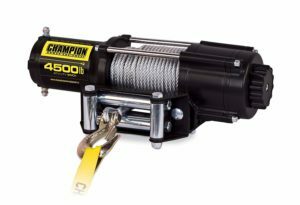 The Champion Power Equipment may not be a popular brand, but after looking at its power winch, it earned its way to be on this list. A distinct quality about the 14560 power winch is that its controller is wireless, making it easy to control the motor. You don’t need to worry about setting the wires properly so it doesn’t come in the way. You can comfortably control it after setting the hook and just get in your car and get on with using it. The 14560 is made to be used with smaller vehicles such as all-terrain vehicles and UTVs. Due to its compact design, it can be mounted easily and can pull a load of max 4500 pounds which is great for small winch applications. In terms of braking, the drum brakes do the job well at keeping a solid grip of the rope. The motor has a 3 stage planetary gear system similar to almost all the power winches available in the market. The unwinding of the rope has been made easy with its free spinning spool. It features a steel rope which is galvanized, helping it to resist rusting and corrosion. Also, included with the package is a mounting plate which can be easily installed on almost any ATV vehicle. SuperWinch is back with a lightweight electric power winch designed for ATVs if you own one. It maintains its solid design and built using high-end materials. The winch with the motor can be powered using your vehicle’s battery. It has a strongly made spooler on which the rope rests and will unwind without putting too many efforts. This winch includes a lightweight but a strong motor capable of pulling a max load of 3000 pounds so that rough terrains do not stop you and your vehicle. Most importantly, the motor is extremely quiet during operation. It maintains a 3 stage planetary gear system so rest assured of the motor’s quality and strength. It can be easily operated with the provided controller with a long enough cable that increases the controller’s reachability and overall usability. A mounting plate is included in the package. Features a strong drum braking mechanism which is highly dynamic. The winch’s drum supporting the cable often comes loose and needs to be retightened frequently. Things to consider before buying an electric winch. To know which winch will suit your truck or SUV the best is by determining the size of your vehicle. By doing that, you can know how heavy your vehicle is and how powerful its engine is. According to that, you should select a winch. The winch shouldn’t be too heavy if you have a smaller SUV or truck. Similarly, you should not get a winch too light as it might fail to perform what it’s supposed to do. The price can often be worth checking out. How much are you going to use the winch and how extreme will your situations be? In case you are going to use the winch for simple tasks like dragging light parts, you may not need to look at the more expensive one. But if you are going to use it in the woods for extreme driving, you may want a high-quality winch, because you do not want one that is breaking apart in the middle of the forest. The handiest vicinity to get a winch might be Amazon due to the fact you may be able to pattern all styles of winches without having to go to exclusive shops that handiest inventory a particular brand. Amazon additionally gives you the opportunity to examine what other customers assume a selected winch that can be of interest to you. Buying winches from an internet shop deliver many transportation alternatives that will suit within your price range. You may want to check how easy you can get replacement parts for the winch if it fails. You do not want to buy a winch that one small part brakes down, and you can’t buy a new one and you have to replace the whole winch. Check if the company is located in your country and ask them how fast you can get replacement parts. You want to check for how long you will get warranty before purchasing the winch. The most winches in our list have a warranty between 2-5 years and you really want to consider this when you are checking at the price also. The longer warranty the manufacturer gives, the more sure are they about their product which could tend on the quality of the product. The primary object may be a winch, however, you may additionally want to produce other accessories that could prove to be crucial whilst using a winch. A pair of gloves can also end up handy mainly whilst managing a steel cable. Owning a take hold of field make using a winch quite clean because it helps you change the attitude of pulling without traumatic approximately the location of the winch. It is an essential accent especially when you need two connection points. There are two major types of winches. Namely, the hydraulic winches and the electric power winches which we covered in the list above. Both winches work differently. It’s like comparing an electric steering and a pump based hydraulic power steering. The hydraulic winch relies on a pump. The pump itself relies on the engine for power just like a power steering pump. Whereas, an electric power winch relies on a motor which runs from a 12-volt battery, often from the car or the ATV/UTV. That way, the engine is relieved from proving the winch power, putting no load on the engine. Both have their advantages and disadvantages. A hydraulic pump may output greater strength than an electric winch, only if the engine is fired up and most importantly, strong enough to have enough power for other things. An electric winch has its own motor as a power source and all it needs its power from a healthy battery. In case the battery is weak, the electric winch may not be able to perform fully. In this article, we have listed Electric Winches, but it can be a good knowledge to learn abit about both of the models. As mentioned earlier, electric winches depend completely on electricity. These have their own motors mounted with the winch. The motor is powered using the car’s battery. The advantage with electric winches is that the winch doesn’t take power from the engine via any pump which relieves the engine of any load. The downside, on the other hand, is that, since electric winches rely on battery power, the battery from which it to get power should be strong and healthy and able to release the strong energy needed by the winch. With a dead battery, you will experience a dead winch. But one of the greatest advantages of electric power winches is that, in muddy and tough terrain, if the engine dies and refuses to start, the electric winch will still work and help you to get your car out of the hazard. Plus, electric winches are cheaper than hydraulic ones and depending on the motor, they too output about the same strength as hydraulic winches. Coming to hydraulic winches, these winches were heavily used in the earlier times when electric winches weren’t introduced. These winches get their power from the engine. These winches have a dedicated pump with a pulley. That pulley is connected to the engine via a belt, just like hydraulic power steering pumps. These pumps contain a special fluid which is pushed via the hoses all the way to the winch. That’s how the winch gets its power. But although powerful, these winches rely completely on the engine for power for itself. These type of winches are most common in large trucks and still, a lot of cars and vehicles feature a hydraulic-based winch. Before going out to get a winch for your car, it’s better to learn about the types of cables for the winches. There are two major types. The steel cables and now the more popular, synthetic ones. These cables are made of steel and have been used for many years. These cables are still widely used. These cables remain as the most reliable type of cables for not just winches but other applications as well. The problem before with these cables was that they would begin to rust soon after they were exposed to water. That would quickly make these cables weak. But now, with advancements, special compounds are used with steel to make these cables which prevent the steel cables from rusting and corroding. These types of ropes have been introduced in the market not a long time ago and continue to gain popularity fast. These cables are made up of a strong plastic capable of withstanding extreme pressures, enough to be used in winch applications so it is safe to say that synthetic ropes can too be a good alternative to steel cables as synthetic ones don’t rust and rot and remain intact even in harsh weather conditions. To conclude the article, the heavy-duty power winches come at a higher price but doesn’t mean those will suit your particular vehicle. It is very important to know your car’s weight and size and also the purpose of buying a winch. Keeping these factors in mind, buying the right winch becomes a piece of cake.